There are times when a good game is just what the doctor ordered. Sure, movies and books are great, as is a fabulous conversation over a delicious dinner (or in the cockpit at sundowners.) Sometimes, though, a game is what is craved. When you want to go beyond charades or standard card games like BS or War, you might want something else. Here, in no particular order, are our Calypso favorites. 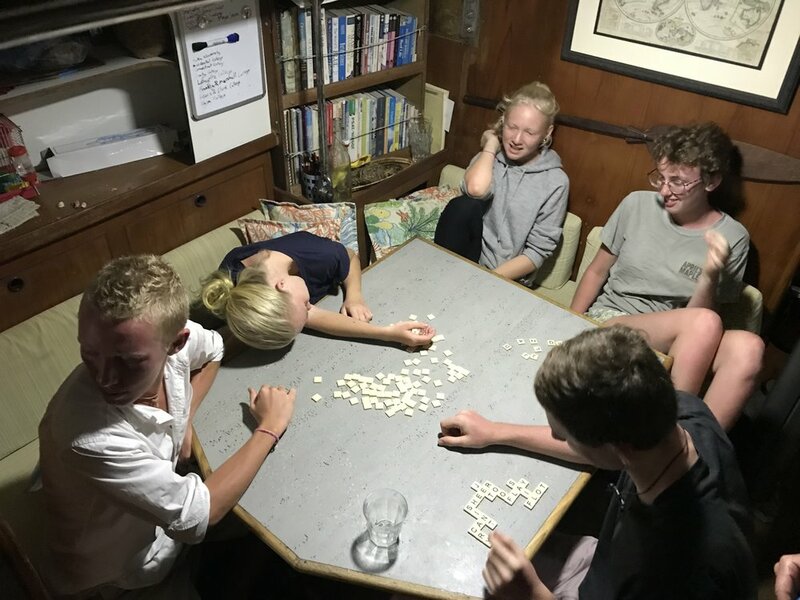 A few, like Pounce and Rummikub, are steeped in family tradition. Others we've picked up along the way. Pounce. This requires a deck of cards per person, ones with different designs* on them. Finding interesting cards can be a good excuse for haunting tourist traps. The different designs are so you can keep track of who’s played what. It’s a bit like a mutated game of double or triple or more solitaire, where the aces go in the middle but are fair game for every player to build on. This is a good post explaining it; when I write up a better one, with pictures and a video, I’ll share it. This is best played with at least 4 people, and gets nuts when you’re into the double digits of participants. Ideally played down below, and the number of players may well be limited by main cabin space. Set. A 2-person pattern-recognition game of the highest order. You can play this solo also, but it’s more fun with an opponent. Cards mean this is better played inside. RummiKub. This is a 4-person game that “can” be played with 2. Tiles make it wind and moisture-friendly. I prefer playing it on a table rather than on the floor/beach. Mexican Train. Fun, addictive, and strangely strategic game that’s a specific version of dominos. Comes in its own tin case, making storage easy, though I’m not sure how well the tin will last in salt air. Maybe seal it with a coat of clear polyurethane? Can be played with 2 or more (up to 6) and is fun with any number. Like Rummikub, tiles make this an outdoor-friendly game. Bananagrams. Play by yourself, with a partner, or with the crews from 2 or more boats. This is another tile game (comes in its own cool banana-shaped cloth carrying case) that is handy to pull out anytime you’ll be waiting for a long time in a place where playing games is okay. It’s like competitive individual scrabble, where you build a crossword-style design of your very own with the goal of using up all your tiles. Prepare yourself for laughter, cursing, and fast-paced word creation. If you have a larger crew, or routinely entertain people and want a larger set, you can buy a double set for much less than buying 2 individual sets. Other fun ones include Quirkle, Cards Against Humanity (not for the faint of heart or easily offended), and Pictionary. What are your favorite games? Are there new ones I need to investigate before we leave?